When most people think fishing, the usual picture that one sees is someone sitting gently by a sea or a lake, with the water completely still and abundant with fish. Reality tends to be quite different. Many people do not have access to such a scenario where the water is calm and the fish are easy pickings. Yeah, I am talking about river fishing, and whether you like it or not many people have to settle for river fishing instead. And imagine what the conditions are like if it isn’t a narrow lake, but an extremely wide one that is also very deep. How would you deal with that then? You know, because most of the fish would likely be towards the middle of the river, and the river current would be so fast that even properly catching the fish would be an issue. Concerned, are we? Fret not! We are here to tell you exactly how you can tackle many problems related to big river fishing. First of all, we will talk about what you have to do before you even begin fishing, which is more focused advice on research and precaution. 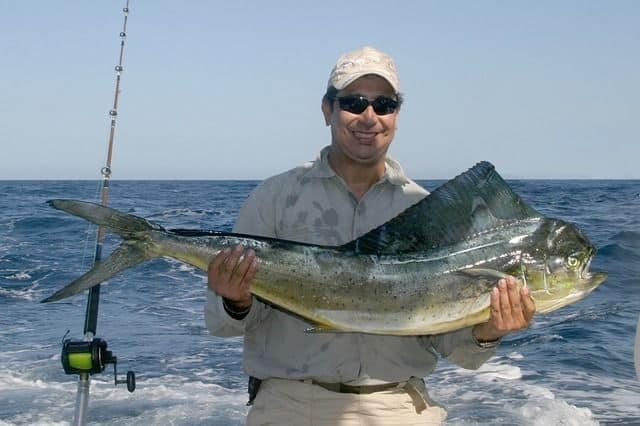 Next, we talk about what are some of the things to do while you are on the fishing trip itself. These include a whole bunch of tips on how to do the actual fishing. These may not seem very significant, but trust us these will help you loads. 4 What To Do WHEN Fishing? A lot of what you have to do depends on how you prepare for it. This includes mainly getting geared for the particular environment, in this case not just the fact that it is a big river, but also the time of the year, water levels, the kind of fish available and the environment inside the water. Think of all the things that you would have to take into account, and then select the gear that is right for it. Let’s start with some of the more obvious ones first. Get a fishing rod and line combination that suits the size of your fish. If you do some elementary research, you will find loads of combinations for each of these and which products will suit a particular range of sizes of fish. With big river fishing, much of the fish you will get is likely to be large and heavy. Your rod and line need to be able to withstand that kind of weight, while at the same time not being too heavy which might slow you down. Your line also might have to go through rough terrain underwater. It needs to ideally have a bit of durability too as a result. Many people also happen to carry around a boat. This is handy because you can go towards the middle of the river using a boat and fish in a much larger area of water. Reaching all the nooks and crannies is easier and of course, you are more likely to find fish. A really handy tool for river fishing is a pair of polarized glasses. These are essentially glasses that give you x-ray vision into the water so that you can see the fish inside the water. With your eyes, it gets difficult to see because the water does a good job hiding things within. With polarized glasses, much of the camouflage is gone so you can pick and grab fish at will. Finally, make sure to bring live bait for fishing. Live bait is a significant upgrade over things such as fish food (yes, people do use them!) especially since these are the natural diet of fish. Next, you need to learn quite a bit about the river and the fish living in the river to find out. First and foremost, find out the rough temperature and depth of the river for the time you are going to fish. Knowing these will greatly help with guessing many of the other stuff, such as the kind of fish likely to be there. Oh, and depth will also determine how effective using a boat will be. Or, to be more straight-forward about it, you need to make sure your boat can actually float! If it gets too shallow, your boat will get jammed, end of story. Next, you need to find out areas in the water with vegetation. Yes, you will be looking for weeds! The ones underwater are quite rare in big rivers. Here, it acts similar to how an oasis works in the desert because the fish flock towards the weeds. You should also identify backwater regions of the river because the slower currents attract more fish. Because the area is calmer and therefore safer, fish tend to throng there. And a larger group of fish means more catch for you! Now, once you are done finding out about the river itself, it is time for the fish. All rivers have certain species that are considered natives, even if they are migratory, kind of like Aunt Marge who stays at your place every Autumn! Rivers are freshwater areas, with lower than 0.05% salt in them. Approximately 41.24% of all fish species reside in freshwater bodies, and when you add migration into account, it becomes a rich source of fish. Anadromous fish, which mate in freshwater but live in saltwater, will be available during breeding seasons. On the other hand, fish that breed elsewhere but live in the rivers will be available most of the time. That is why you need to think of what time you will be going fishing because it will affect what fish you will find. Next, you need to find regions of the river where fish are more frequently found in your selected time. The reason is fairly obvious, but these are small things many overconfident people avoid doing to save time and end up spending time later on. The head starts really help! Now, there are many ways you can get information, but some of the sources are more effective than the other. Trust us, a little effort goes a long way! What To Do WHEN Fishing? Now, when you do the actual fishing there are several things that you can do to get more fish and make your fishing a lot easier. Let’s break it down a bit. 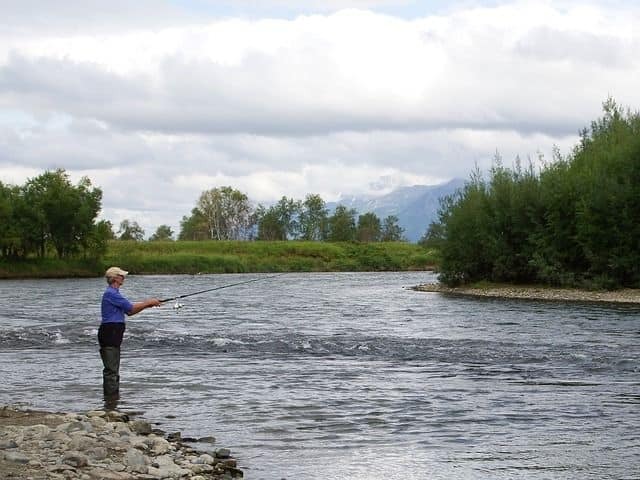 Most people are tempted to start fishing immediately in the middle, and even more so when the part of the river close to their riverbank isn’t getting much fish. Note to self: the grass isn’t greener on the other side! The ideal way to start is by having a shorter line and fishing closer to your side of the river bank first because it is much less work. It is right by you, and unbeknown to most people, the shallow waters do tend to have quite a bit of fish because they are closer to land. Once these have been properly exhausted, you can think of fishing more centrally, or closer to the opposite banks. The idea is that if you have very little bites close-by, fish are either on the other side, so use a long line, or towards the middle. Remember we told you to look out for vegetation? Well, weeds, rocks, and small islands on the river (if any) are likely to house more fish than regions with just flowing water. Go fish in those areas, and you can tell if fish are there with the polarized glasses too. Also, we would recommend going to the backwaters first, because you would want to start your fishing in waters with a larger fish population. Otherwise, a slow start might dampen your mood and ruin the rest of your fishing experience on a bad day. Now that we have a good idea regarding the places where you could go, let’s look at some of the things that can be done. First and foremost, you will need to have the right bait for the right fish. There are many kinds to select from, with fish having very many preferences. You also will have a particular ‘to-dos’ when looking for a certain fish. This is where fish knowledge comes in real handy. Some fish prefer live bait such as maggots, while others might like bread. For example, chub prefer maggots while certain non-predatory fish would have ground bait. Use the right kind of bait for your fish. A handy trick with live bait is bait bottom bouncing. This is where living bait is bounced off the river bed, which may seem quite tricky, but there are certain contraptions that can achieve this. And boy do they work well! What this does is that it makes the bait seem in place, like the poor fella accidentally fell into the water to become fish grub! The contraptions are called rigs, and once you bounce it parallel to the river flow, fish will go after the bait in no time. Unsuspecting fish will take a bite of it, and you have your catch. Next, while it is common sense, but try not to disturb the reel while it is in the water. Vibrations in the water are more violent and noticeable than in air so even slight movements in the water can scare away fish. Sneaky is the way to be, and the best way to do that is staying still. With big river fishing, a general rule of thumb that you can go for is going in with longer lines so that you go farther and deeper (once you have exhausted the area nearby!) into the water. This is where the biggest fish will often be, so if that is your plan you are going to get bigger fish this way. And if the water level is low on the river, you are more than welcome to step into the water to find the fish! It is easier to reach everywhere that way. Many fishermen do it, but one thing that you need to be sure of is casting long, not short. If you fish closer to you, your movement is going to scare fish away. There are also some fish that are easier to catch when luminosity is low. Salmon is harder to catch during the day, especially under bright sunlight. Once again, fish knowledge is key. While you will have a hard time seeing things, being able to find salmon will be worth the extra effort. Go fishing during times of low light if it helps. Also, don’t be tempted to start fishing in calm areas with slower currents, even if you can see a lot of fish there. Fish are capable of staying in place under faster currents, and it makes them difficult to spot. You can fish anywhere, as long as you know where the fish are going to be. You also shouldn’t always use a long line or a short line. Ideally, if the water is calmer, use a longer line for better reach. In faster currents, shorter lines will help catch fish better. 1. When is the best time for river fishing? A: This is pretty much season based. Although not all fish is available all year round, the most fish are available between April to July. Towards August, things do tend to slow down, though different species show up as well. 2. Are there restrictions on fishing? A: Yes, and you should know them before you go fishing! Each state and even each fishing area will have different rules and regulations, so it is good to catch up on them to avoid hassles later on. 3. Can I use the boat everywhere? A: No, boats can only be launched in certain places. Most of the frequented fishing spots will have them marked close by, and if you are concerned a fishing guidebook for that locality will tell you. 4. I’m all by myself but want to fish with others. What should I do? A: There are groups of anglers on Facebook who you could contact via groups or pages. There are also local fishing clubs and the likes where you could ask for companionship as well. Big river fishing is quite challenging, but it is worth it once you have the loot! It is a great way to have fun, do something that gets the adrenaline pumping and also grab fresh food. With a little bit of effort and preparation, you can have a great experience and look good doing so, too.